How do the communities, families and cultures that people grow up in determine their actions and values? How do ethnic and economic classes affect their interactions with society at large? The field of social work endeavors to promote human well-being through the alleviation of poverty and oppression. But to effectively serve people, social workers must first understand the interconnections between people’s behaviors and the social context in which they live. Human Behavior and the Social Environment explores how biology, sociology, psychology and culture influence people’s actions and interactions. Author Joe Schriver, professor of sociology, has created a framework that examines social development on every level, from individuals to families, groups, organizations and communities. His text outlines traditional theories of human behavior while introducing alternative perspectives, including feminism, multiculturalism and gay-lesbian/bisexual viewpoints. It also modernizes the study of HBSE by considering the impact of globalization on poverty and the effects of technological advances on the lives of individuals and on the field of social work itself. 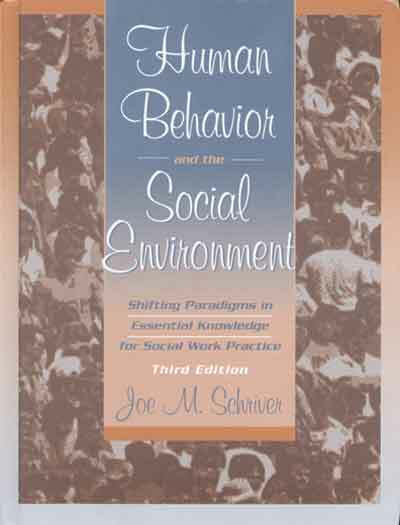 Now in its third edition, Schriver’s book has been adopted by 40 states for use in more than 100 schools, including Harvard, Vassar, Rutgers and Tulane.